For Anti Bullying Week, we’ve put together a list of recommendations for children and young adults on the subject of bullying. 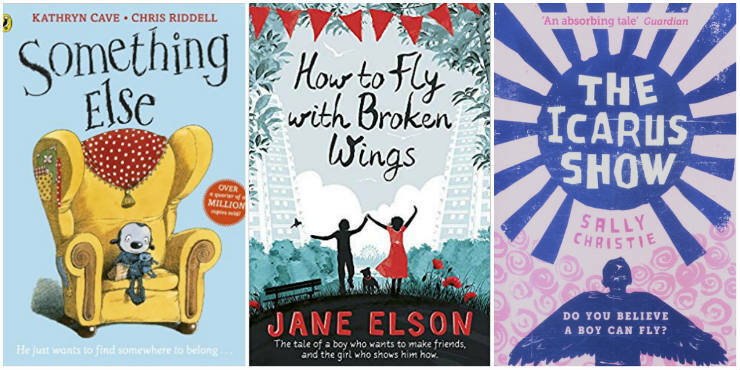 Bullying can be frightening and isolating, so we hope that these titles help young people who are being bullied to feel less alone, and seek help. Even if they’re not being bullied, it’s important for children to understand how it feels to be in such a situation and learn what to do if they experience or witness bullying. A story about exclusion, the most common form of bullying amongst young children, this book deals with difference and the power of friendship. It’s lovely to read, well resolved and an excellent choice. A super book about the harm caused by name calling, Secret Friends was shortlisted for the Carnegie Award for its intelligent and sensitive portrayal of difference and racism in schools. “Rose wishes Zack wasn’t always teasing her at school. Then her Uncle Vinnie conjures up a magic way of stopping him. Ratty, the classroom pet might look like just a cute rat to Rose, but, as bully-boy Zack finds out, there’s more to this little furry rodent than meets the eye. “Frank doesn’t know how to feel when Nick Underbridge rescues her from bullies one afternoon. No one likes Nick. He’s big, he’s weird and he smells - or so everyone in Frank’s class thinks. “Tina is a triplet, but she’s always been the odd one out. Her sisters Phil and Maddie are bigger and stronger and better at just about everything. Luckily, they look after teeny-tiny Tina wherever they go - but when the girls start in scary, super-strict Miss Lovejoy’s class, they’re split up, and Tina has to fend for herself for the first time. “Tina is horrified when she’s paired up with angry bully Selma, who nobody wants to be friends with. But when Miss Lovejoy asks them to help her create a butterfly garden in the school playground, Tina discovers she doesn’t always need her sisters - and that there’s a lot more to Selma than first meets the eye. “David and his best friend Michael were tagged with awful nicknames way back in preschool when everyone did silly things. Fast-forward to seventh grade: ‘Pottymouth’ and ‘Stoopid’ are still stuck with the names - and everyone in school, including the teachers and their principal, believe the labels are true. So how do they go about changing everyone’s minds? By turning their misery into megastardom on TV, of course! “Masher is the bully of Storey Street. No one ever dares stand up to him and that’s the way he likes it. But then Jemima and her family move into the plot of land next door. Jemima isn’t afraid of him at all, and she’s making him look like a bit of a wimp. To Masher, that just means one thing: war. “Max is used to being called Stupid. And he is used to everyone being scared of him. On account of his size and looking like his dad. Kevin is used to being called Dwarf. On account of his size and being some cripple kid. “Annabelle has lived in Wolf Hollow all her life: a quiet place, still scarred by two world wars. But when cruel, manipulative Betty arrives in town, Annabelle’s calm world is shattered, along with everything she’s ever known about right and wrong. “As she unpacks in her new bedroom, Ella is irresistibly drawn to the big old house that she can see out of her window. Surrounded by overgrown gardens, barbed wire fences and ‘keep out’ signs. It looks derelict. This is a dark tale, highly illustrated and an affecting portrayal of bullying and its consequences. “School should be a safe place for Jess, a refuge from her difficult home life - but thanks to Kez and her friends, it’s everything she dreads. “Alex has worked out a foolproof way to avoid being picked on. Don’t react. It’s so simple, it’s brilliant! David does react and becomes an outcast, nicknamed Bogsy. He’s branded a weirdo and Alex is determined to avoid the same fate. This moving novel deals with the pain of social isolation and bullying so bad it leads to an attempted suicide. It’s utterly absorbing and thought provoking. “Meet Stewart. He’s geeky, gifted, and sees things a bit differently to most people. His mum has died and he misses her all the more now he and Dad have moved in with Ashley and her mum. Meet Ashley. She’s popular, cool, and sees things very differently to her new family. Her dad has come out and moved out - but not far enough. And now she has to live with a freakazoid step-brother. “16-year-old and not-so-openly gay Simon Spier prefers to save his drama for the school musical. But when an email falls into the wrong hands, his secret is at risk of being thrust into the spotlight. And worse still, so will the privacy of ‘Blue’, the pen name of the boy he’s been emailing. With messy dynamics emerging in Simon’s once tight-knit group of friends, and his email correspondence with Blue growing more flirtatious every day, Simon’s life suddenly becomes just a little complicated. “The headmaster of Trinity College asks Archie Costello, the leader of the Vigils, a secret society that rules the school, to help with the selling of 20,000 boxes of chocolates in the annual fund-raising effort. Archie sees the chance of adding to his power - he is the Assigner, handing out to the boys tasks to be performed if they are to survive in the school. “He’s coming to kill me. Now would be a good time to run. I can’t run. I’m too afraid to run. We work/have worked for Suffolk Libraries Stock Team.